Abstract: In clinical practice, signifi cant lesions of the innominate artery are far less common than subclavian artery stenoses. In these patients both the blood flow to the right arm and the right carotid circulation is impaired, resulting in an increased risk of ischemic cerebrovascular events. 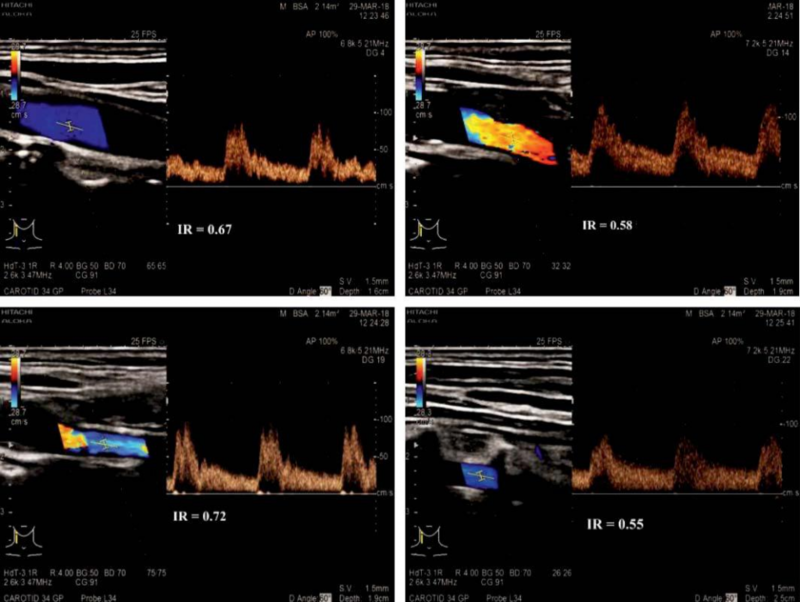 Vascular ultrasound is a useful noninvasive tool for occlusive diseases of the subclavian and innominate arteries, but direct visualization of these proximal segments is difficult, and diagnosis is usually based on indirect Doppler signs. 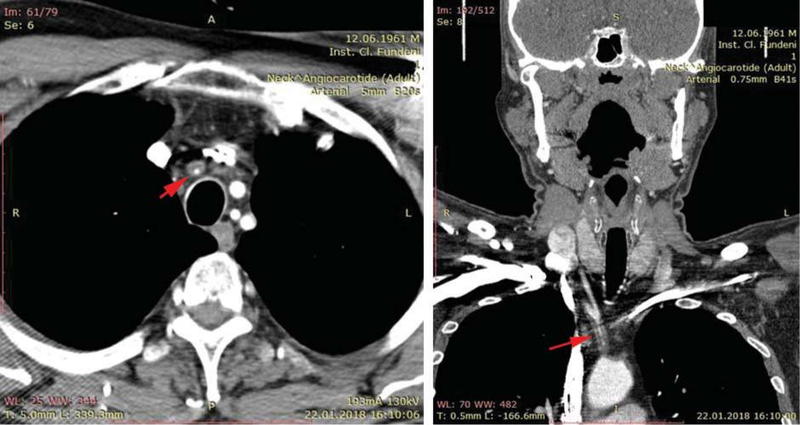 We present the case of a 56 years old patient who was admitted for dyspnea at moderate exertion. He was a heavy smoker, with poorly controlled type 2 diabetes mellitus and dyslipidemia. Basic cardiovascu-lar and neurological exam did not reveal any abnor-mality, except marked bilateral arm blood pressure (BP) difference on repeat measurements – left arm BP was 120/60mmHg, and right arm systolic BP was 70 mmHg. Blood tests revealed hyperglycemia (217 mg/dl) with an elevated HbA1c (7.5%). Doppler ultra-sound of the extracranial arteries was performed, and the spectral Doppler tracings from the right and left carotid and vertebral arteries are shown below (Figure 1 and Figure 2). The indirect Doppler signs revealed by vascular ul-trasound: the complete reversal of flow in the right vertebral artery and the systolic reversal of fl ow in the carotid arteries were suggestive of a significant obstructive lesion of the innominate artery. Of note, in addition to these Doppler findings, the diameter of the right common carotid artery was considerably smaller than at the level of the left common carotid ar-tery (4.2 mm versus 7.6 mm). Computed tomography angiography was performed in order to confirm these results and for an accurate description of the vascular lesion (Figure 3). In patients with severe innominate artery disease blood flow to the right arm is ensured by retrogra-de flow through the right vertebral artery, similar to the subclavian steal phenomenon in severe lesions of the subclavian artery1. Additionally, carotid circulation is affected in various degrees. Doppler vascular ultra-sound reveals a distinctive pattern of hemodynamic alterations in the right carotid and vertebral arteries, depending on the multiple ways of compensation of cerebral circulation through the circle of Willis and the association of contralateral carotid or vertebral stenosis. Findings include reversed or bidirectional flow in the right vertebral artery and the presence of mid-systolic deceleration or the complete reversal of flow in systole in the right carotid artery and its bran-ches2. Identifying these particular vascular Doppler signs is essential in clinical practice, since although uncommon, innominate artery lesions are associated with neurologic symptoms in a high percentage of patients. Several theories have been proposed to explain the-se findings. The pressure gradient that occurs beyond the subclavian stenosis relative to that of the systemic circulation was proposed as a potential mechanism for the rapid deceleration of flow in the vertebral artery after peak systole3. In early systole, the systemic pre-ssure exceeds the pressure in the arm and blood flow slows dramatically or reverses in the vertebral artery. In late systole and diastole the systemic pressure falls, and is exceeded by the pressure in the poststenotic segment and antegrade flow is restored in the ver-tebral artery. With the increasing grade of proximal stenosis, midsystolic deceleration and ultimately flow reversal occur for a longer period in the cardiac cycle. This explanation is generally accepted for the classic subclavian steal phenomenon while midsystolic de-celeration in the carotid arteries is more difficult to explain. It may be the result of a pressure gradient between the left and right carotid arterial systems communicating through the circle of Willis2. In view of the central location and large caliber of the innomi-nate artery and the gradual development of stenosis in most patients, the potential for recruiting collateral arterial flow is considerable. The Doppler findings are further complicated by the presence of significant con-tralateral carotid lesions. In our patient the left carotid system and the left vertebral artery were patent, without signs of signifi – cant stenoses. The patient was asymptomatic and the neurological examination was within normal limits. Nevertheless, additional brain imaging is warranted in order to make a decision regarding the management of this particular case. Figure 1. 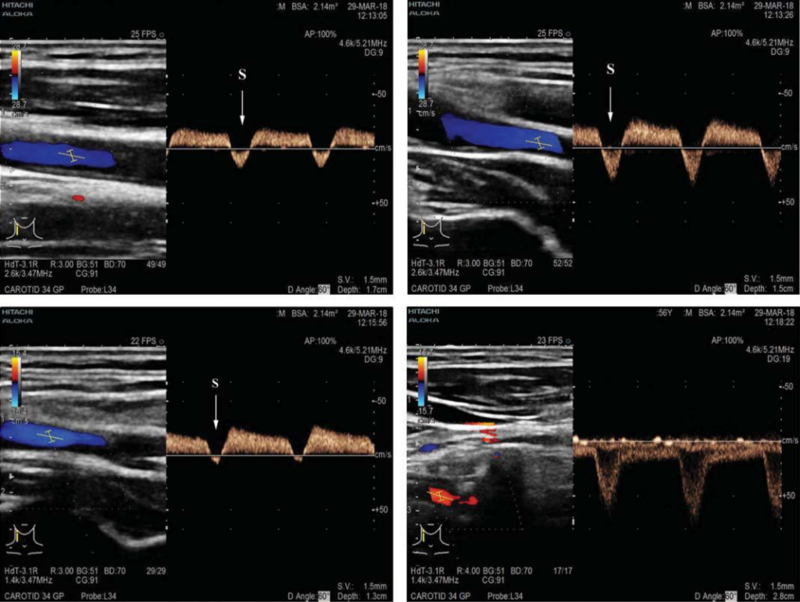 Spectral waveforms from right common (A), internal (B) and external (C) carotid arteries showing the complete reversal of flow in systole (S, arrow) and antegrade flow in diastole. D. Spectral Doppler tracing at the level of the right vertebral artery showing a complete fl ow reversal. These abnormalities are highly suggestive of significant innominate artery stenosis. Figure 2. Spectral Doppler tracings at the level of the left common (A’), internal (B’) and external (C’) carotid arteries and left vertebral artery (D’). Note the relatively decreased resistive index of the left external carotid artery (suggesting internalization) and the increase of flow in the left vertebral artery. Figure 3. Computed tomography angiography, sagital view (A) and coronal reconstruction (B) showing the circumferential thickening of the innominate artery wall on its entire length, with a patent lumen of minimum 2 mm (red arrows). 1. Grosveld WJHM, Lawson JA, Eikelboom BC, Windt JM, Ackerstaff RGA. Clinical and hemodynamic signifi cance of innominate artery le-sions evaluated by ultrasonography and digital angiography. Stroke 1988; 19:958–962. 2. Grant EG, El-Saden SM, Madrazo BL, Baker JD, Kliewer MA. Innomi-nate artery occlusive disease: sonographic findings. AJR Am J Roent-genol. 2006 Feb;186(2):394-400. 3. Kotval PS, Babu SC, Shah PM. Doppler diagnosis of partial vertebral/ subclavian steal convertible to full steals with physiological maneu-vers. J Ultrasound Med 1990; 9:207–213.